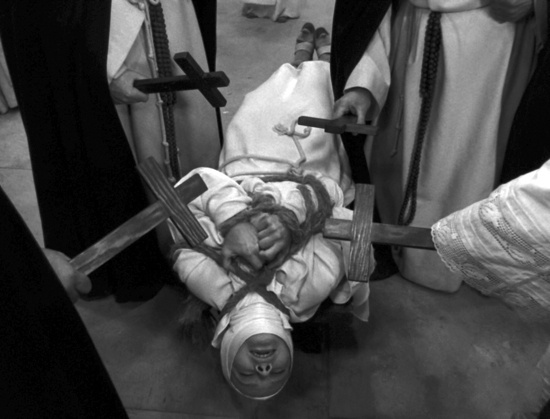 In 1634 a Roman Catholic priest was burned alive at the stake accused of witchcraft. He was in league with the devil, his trial had ascertained, and was responsible for seducing an entire convent of Ursuline nuns. His name was Urbain Grandier and most will know him through Oliver Reed's portrayal in Ken Russell's The Devils. That film, recently resurrected onto DVD by the British Film Institute, was one of a number of interpretations of the so-called 'Loudun possessions', itself having been derived from Aldous Huxley's 1952 non-fiction account, The Devils Of Loudun. Huxley had also been the source for a John Whiting play commissioned by the Royal Shakespeare Company in 1960, while Alexandre Dumas had penned an earlier theatrical account a century before. For good measure there was also a Krzysztof Penderecki opera, again named The Devils Of Loudun, in the late Sixties. These various dramatisations and interpretations each took Grandier as their prime focus. Russell had the charisma of Reed - an actor at the top of his game - to fuel The Devils. Penderecki had the great Polish baritone Andrzej Hiolski. When Whiting's play crossed the Atlantic and reached Broadway, it attracted the likes of Jason Robards and a young Frank Langella to the role. Yet Grandier was only ever part of the story. After his execution the 'possession' of the Ursuline nuns continued, attracting further priests and exorcists for another three years. Huxley devoted a quarter of his account to events after Grandier's execution, the key player in his wake being a missionary by the name of Jean-Joseph Surin. A "sick man" and "a victim of neurosis", according to Huxley, prone to "incapacitating psychosomatic disturbances" - Surin was a far cry from the magnetism of a Reed or an Hiolski in their prime. Despite being ignored by Russell, Dumas, Whiting and Penderecki, Surin was to provide the inspiration for a Polish novella by Jaroslaw Iwaszkiewicz written during the Second World War and subsequently seen as something of an anti-fascist allegory. Its author remains a popular favourite in his home country yet is little known outside. If we know him at all it is thanks to big screen adaptations: Andrzej Wajda's Young Girls Of Wilko or, more prominently, Jerzy Kawalerowicz's take on the Surin story, Mother Joan Of The Angels. Made towards the end of 1960 and receiving its premiere in February of the following year (shortly before the RSC first staged Whiting's play), the latter won the Special Jury Prize at the '61 Cannes Film Festival. For all the plaudits, however, it never quite managed to stay in the public consciousness in the way that both the Russell and the Huxley have managed. With The Devils currently proving to be something of a bestseller for the BFI, it's time to change that. Mother Joan Of The Angels could be considered a sequel to the Russell film. It opens with the stake that had once tied Grandier (here named Garniec) reduced to nothing more than charred remains. Nestled in a landscape of dirt and dust, this isn't anything like the Loudun of Derek Jarman's immense set designs which had adorned The Devils. Whereas Russell, naturally, went for the overwhelming, Kawalerowicz prefers the quiet. His drama unfolds in stark, almost chiaroscuro black and white to the point where even if it had been filmed in colour you get the impression things would remain entirely monochrome. His soundtrack is free of the atonal majesty of Peter Maxwell Davies' score, instead favouring hymns and chants or the occasional jaunty folk tune. This is chamber piece cinema, one that utilises few locations (just the convent, an inn and the desolate wasteland in-between) and almost as few players. The initial scenes suggest a horror film may be on the cards. As Father Suryn (to use the spelling on the credits) arrives at the inn he is subject to the speculation and superstition of the locals. One offers to read his fortune, another possesses a hunchback. At first glance these would appear to be 'colourful' types of the kind that populate Hammer horror warning weary travellers not to enter that castle atop the hill. Indeed, the very first topic of conversation is a bell that rings out intermittently as an aid to those who may find themselves lost in the nearby forest. It does so on the bishop's orders, no doubt a sign that there have been many victims in the past. All very ominous, though Kawalerowicz is concerned with much more beyond genre thrills. Father Suryn has been sent by the church with the sole aim of personally exorcising Mother Joan (the Vanessa Redgrave character in The Devils, here played by Lucyna Winnicka). The convent currently houses another four priests, all of whom are there to deal with the mass possession. Suryn is a true believer convinced that this is the work of the Devil, a belief which is only strengthened upon witnessing his first exorcism within the church. Unlike Russell, Kawalerowicz is less adamant when it comes to stating his own stance. Whereas The Devils concerned itself with exposing the political machinations - a tale, ultimately, of petty revenge not demons or sorcery - Mother Joan Of The Angels strips away the politics, reducing the power play to something more personal. In doing so it is never called upon to explicitly address the question, instead leaving conclusions solely in the mind of the viewer. Is this genuinely the work of the devil, a case of mass hysteria, or something much more controlled with Mother Joan as ringleader? Kawalerowicz is keen to keep us on our toes. His roving camera is particularly unnerving. It will occasionally switch to a first person perspective, only to break off the approach moments later. Such a technique simultaneously draws us in closer to the increasingly claustrophobic goings-on while also being suggestive of another presence. During these instances we are brought, quite literally, face-to-face with Mother Joan and Winnicka's startling performance of a woman zigzagging through her inner torments and the eight devils which supposedly have a hold on her. Much the same is also true of Father Suryn, himself subject to his own internal turmoil. Gaunt and sickly seeming (a cough plagues him throughout), he self-flagellates, denies himself experience of the outside world and is continually drawn into a debate of self-doubt. At one point the actor portraying Suryn, Mieczyslaw Voit, is also called upon to play a rabbi. The two characters share a scene, and a conversation, in which the nature of good and evil is discussed. The doubling is unavoidable, furthering this idea of a man in constant conflict. From their initial contact onwards it is clear that Father Suryn and Mother Joan have a sense of mutual understanding, and perhaps even an attraction. Theirs is a shared experience, subject to the same questions and struggles but manifested through different means. Somewhere underneath this all is a love story played out through a series of stand-offs and strained connections or, for one striking moment, the individual pains of self-flagellation played out on opposite ends of the same room. Suryn is both repulsed and entranced by Mother Joan when at her most unrestrained, at once terrified by her lack of restraint but also recognising the freedom in such episodes. He concludes that he can only save her by taking on her equivalent sins, a move that suggests love is nothing more than a case of mutual possession. A new high-definition transfer of Mother Joan Of The Angels is released next Monday May 28 by Second Run DVD.